On December 11, 2005, The New York Times ran a story on record drought conditions in the Amazonas region of Brasil, linking it to global warming, and specifically the warm ocean temperatures in the North Atlantic that have also been linked to the ferocity of the 2005 Atlantic hurricane season. This prompted a response from Chris Mooney, calling for a comment from RealClimate about whether such an assertion is valid, as we earlier made it very clear that it is impossible to say whether one single extreme event in a very noisy environment – such as Hurricane Katrina – is related to climate change. So we decided to take a look at this phenomena, and address why there might be a connection and what it takes to make an attribution. The background to this story is that the annual northward-soutward migration of the Inter Tropical Convergence Zone (ITCZ) is related to the north-south sea surface temperature (SST) gradients. The ITCZ tends to follow the peak summer sun with rainy seasons where the sun is directly overhead in the tropics and dry seasons otherwise. The ITCZ is not, however, perfectly symmetrical about the equator because, especially in the Atlantic, the northwards cross-equatorial transport of heat means that the maximum SSTs are shifted towards the north. The rain is associated with deep convection caused by the peak in received visible sunlight and the underlying temperatures. It is important to keep in mind that the magnitude of the Atlantic convection may be linked with both Walker circulation and the ITCZ. The Walker Circulation is connected with the El Nino Southern Oscillation (ENSO) phenomenon. The rainfall over the Nordeste region has shown some associations with ENSO. 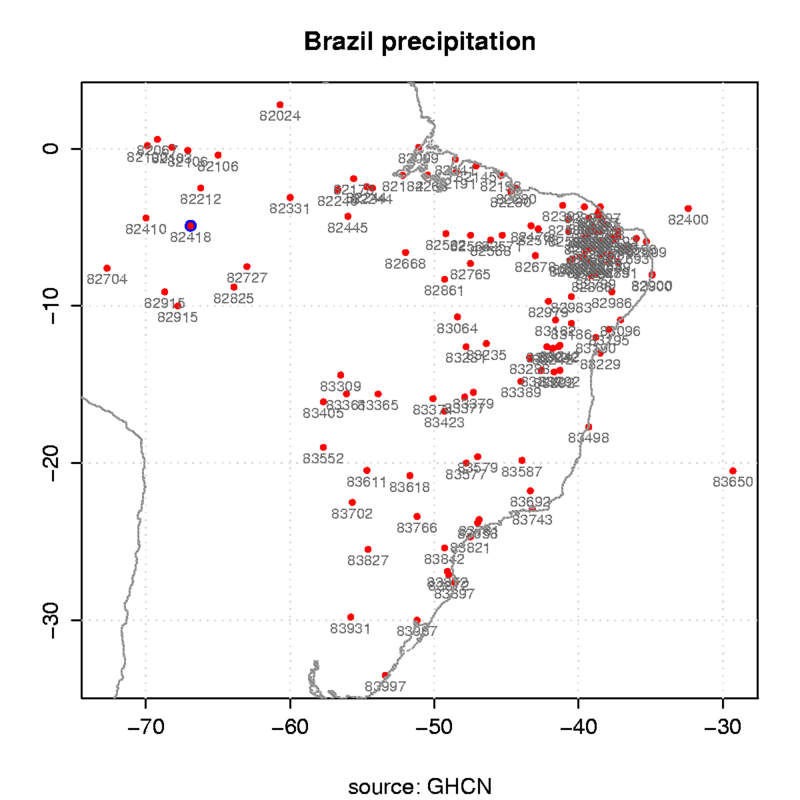 There is a good deal of confidence in this link between ENSO and rainfall over northeastern Brazil, since this empirical relationship also appears to be supported by model studies. The wettest months in the Amazon region is December-February, whereas the June–November months are relatively dry. Updated rainfall deficits for a number of location in northeastern Brazil can be found from the US Climate Prediction Center. The deficit of rain can be seen on on the CPC web pages of NCEP, who also provide maps showing the regional extent of the drought (Note: these data have not yet been quality checked!). These regions don’t appear to coincide with the drought conditions that have been reported unfortunately, which are more concentrated to the south and west of Manaus (up the Madiera river, Acre province (on the border with Peru) etc.). However, more to the east, the deficit in Maraba was mainly caused by the failure of the March–May rains. The attribution of any event to a cause (whether it is global warming or a long term natural cycle or a recurring phenomena like El Nino) simply relies on a probabilistic argument – what is the probablity of such an event occuring in the absence of the supposed cause (P0), and how much more likely is it with the cause present (P). The attribution (in percent) is then 100*(1-P0/P) 100*(1-P/P0) (see this preprint for more details). However, the estimates of the probability are affected both by statistical sampling for recurring events, and by the lack of an identical planet without global warming to act as a control for the climate change case. So these probabilities often have to be estimated from a model. These problems mean that attributions can change as models get better, or when statistics get more significant. In the case of a single event like Katrina, the noise in the system precludes any meangingful statement about the probabilities, although for the European heat wave in 2003 the signal was so strong, and the modelling good enough for an attribution of about 50% to human-related climate change (that is, such an event is estimated to have been twice as likely to have happened in the presence of global warming than otherwise) (Stott et al, 2004). The signal-to-noise ratio improves when there are many events and we see a new pattern emerging, although changes always start with one first event. Thus, if we see more new record droughts following in rapid succession, then this unusual event might be more attributable. However, one should not forget the possibility that extreme events may be clustered in time, for instance if they are modulated by some slowly undulating external factor. These are factors that must go into estimating the background probability of any events. Going back to the situation in the Amazonas region, it is often possible to attribute part of local rainfall variability to large-scale conditions, such as the general circulation or SST (similarly, the correlation for Carauar and S. Gab. do Cachoeira yield negative values for SST in the northern Tropical Atlantic while Manaus yields positive values in the south tropical Atlantic). This can be done through statistical analysis, such as correlation or regression as long as there is good empirical data is available. Thus, if there is a change in the large-scale conditions, then we can infer some of the local consequences. This can also be done using high-resolution nested local area models for a particular region. The former is known as ‘statistical’ or ’empirical’ downscaling whereas the latter is known as ‘dynamical’ or ‘numerical’ downscaling. 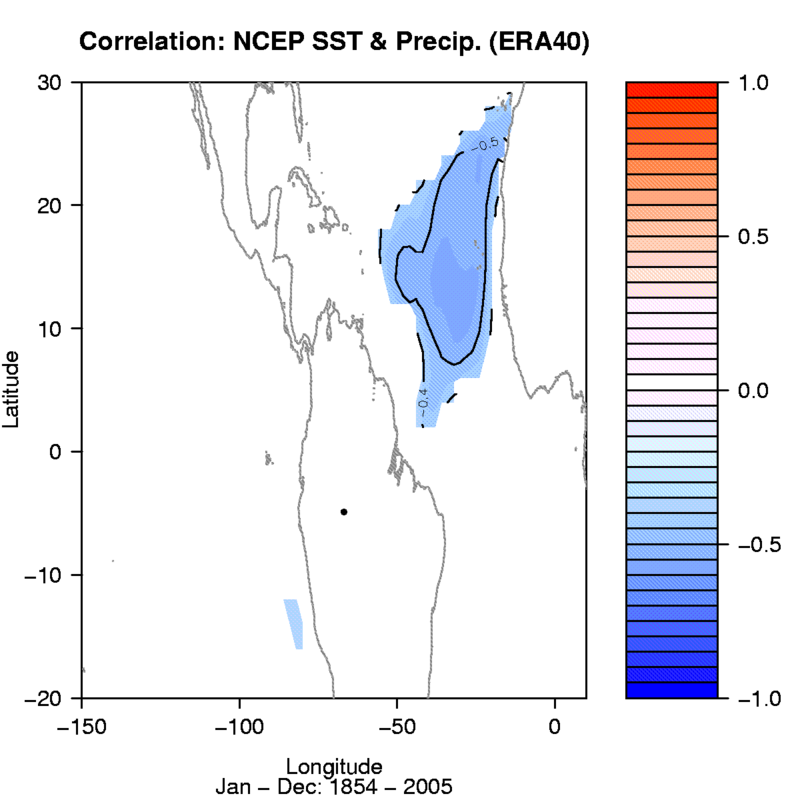 The links between the varying SST gradients and the rainfall anomalies is well known, and shows up as an effect in the Amazonas region. Since it is the SST gradients that are important, this shows up in the correlation maps as a dipole in the tropical Atlantic. 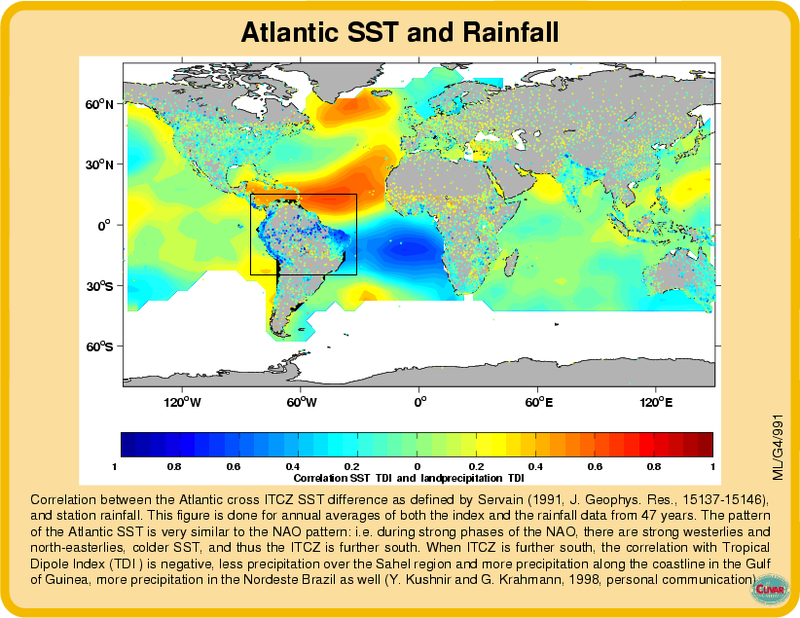 For most of the northeast Brazil, the annual rainfall is, according to these results, negatively correlated with the SST in the Carribean and the tropical north Atlantic, and positively correlated with SST in the southern tropical Atlantic. 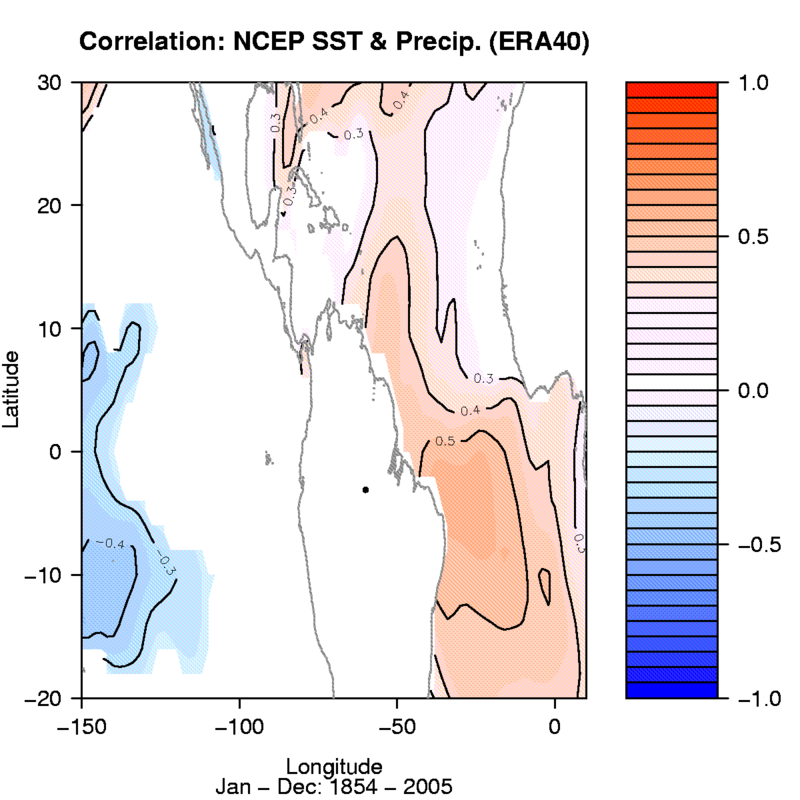 Others have also found that the correlation between SST and rainfall variations varies with time of the year. The correlation pattern varies seasonally as would be expected. However, since the wet season is in December-February and the rain deficit first accumulated over the first months of 2005, it is not really the high SSTs in June-November (potentially associated with the anomalous hurricane season) that are most responsible for the drought, but more likely a combination of high northern spring SST and weak SST anomalies in the tropical southern Atlantic. 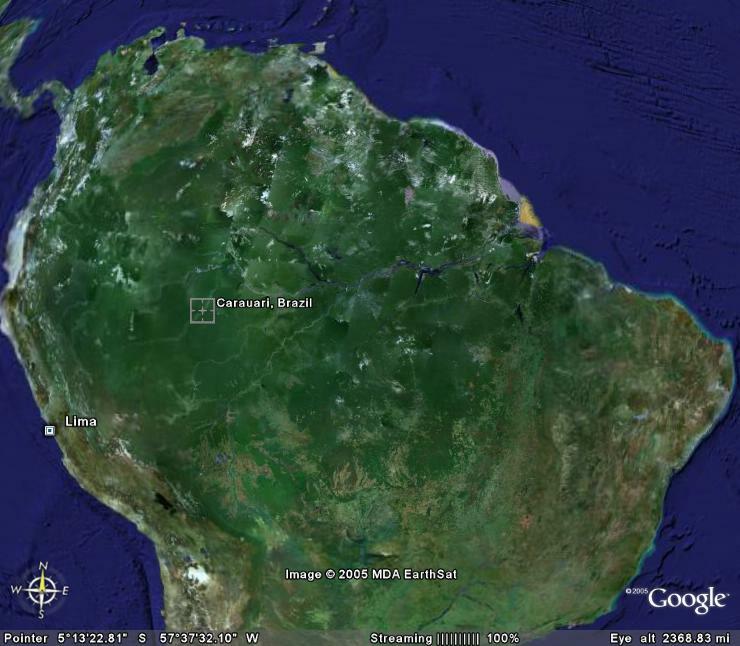 Satellite view of the Amazon region from Google Earth, showing Carauar (Brazil: 4.90S, 66.90W, 81m a.s.l., WMO station code: 82418). A quick statistical analysis suggests that SST variability cannot account for all of the precipitation anomaly over the Amazon (R2 ~ 20% over the Amazon region, e.g. Carauar, Manaus, & S.Gab. do Cachoeira for the January-November rainfall). 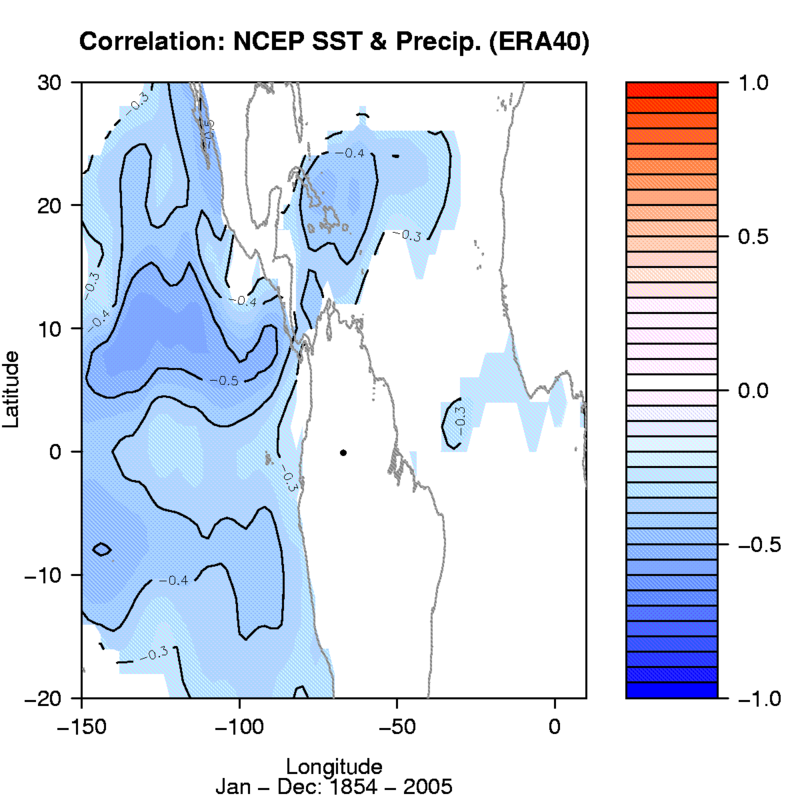 Furthermore, the present SST-based regression models do not give a large reduction in rainfall for 2005. It is important to keep in mind that more than one factor (e.g. ENSO, local effects) may affect the rainfall, and extreme events can arise when several conditions coincide in time and space (e.g. a combination of favourable SST anomalies, atmospheric circulation, local effects, etc). Note that some extreme events, such as storms, can in principle be predicted (and often are) from the large-scale conditions by imposing the large scale conditions onto regional high-resolution models (dynamical downscaling) – this makes it possible for us to predict storms with ordinary weather models or hurricanes with hurricane models. But it is harder to attribute one particular large-scale feature to climate change. The issue here is that there isn’t one class of phenomena that can never be predicted, and one class that can, but that our ability to attribute any event (or series of events etc.) depends upon how much ‘weather’ noise there is compared to the forced signal. Estimating the size of the signal can be done with models or statistics, and the ratio of signal to noise plus how much of change in signal can be attributed to some large scale feature (like global warming) gives a percentage attribution. In summary, it does not appear possible to say that this single event is attributable to climate change as the noise in the rainfall statistics is large. Here the question has been on attributing the drought to an enhanced greenhouse effect, as opposed to the study of the Euopean heat wave, where the link between increased risk of similar extremely hot 2003 European summers and a global warming was estimated; Stott et al, 2004 acknowledge that ‘It is an illposed question whether the 2003 heatwave was caused, in a simple deterministic sense, by a modification of the external influences on climate ‘ . Past studies have shown that rainfall anomalies over the Amazon basin can be associated with SST changes in the Atlantic, but that these SSTs can only account for part of the picture. Hence, the record drought itself likely cannot be solely attributed to the specific 2005 SSTs in the Carribean/Atlantic basin, although high SST nevertheless are likely to have some effect on the rainfall statistics. It may be that better data or more detailed modelling could change this picture though… but that’s a little beyond the scope of a blog posting. So if you put attribution aside, what can you say about increased risk of repeated similiar scenarios from GHGs? When you talk about extremes, is it a generic term, or are you also using elements of the Generalized Extreme Value (GEV) theorem to estimate probabilities? When we talk about an extreme rainfall event, for example, we are usually talking about an event whose probility had been determined by its position within one of three “extremal” distributions. Tornadoes and hurricanes are also often referred to as extreme events, because they are sensational. But to my knowledge, their probabilities are estimated by other means than extreme value analysis (apart from the obvious physical modelling in the short and medium ranges). Anyway, just wondering if you would clarify. I’m a little confused about the underlying definition being used here of “drought.” The map to which you link looks like just a two-month rainfall anomaly, while the rainfall deficits for northeastern South America don’t look particularly extreme in most cases. I’m fond of Kelly Redmond’s definition of drought: “(I)nsufficient water to meet needs.” This suggests a supply as well as a demand component of “droughts,” such that relatively modest precipitation anomalies can today have severe effects because demands on water supply are so much greater. 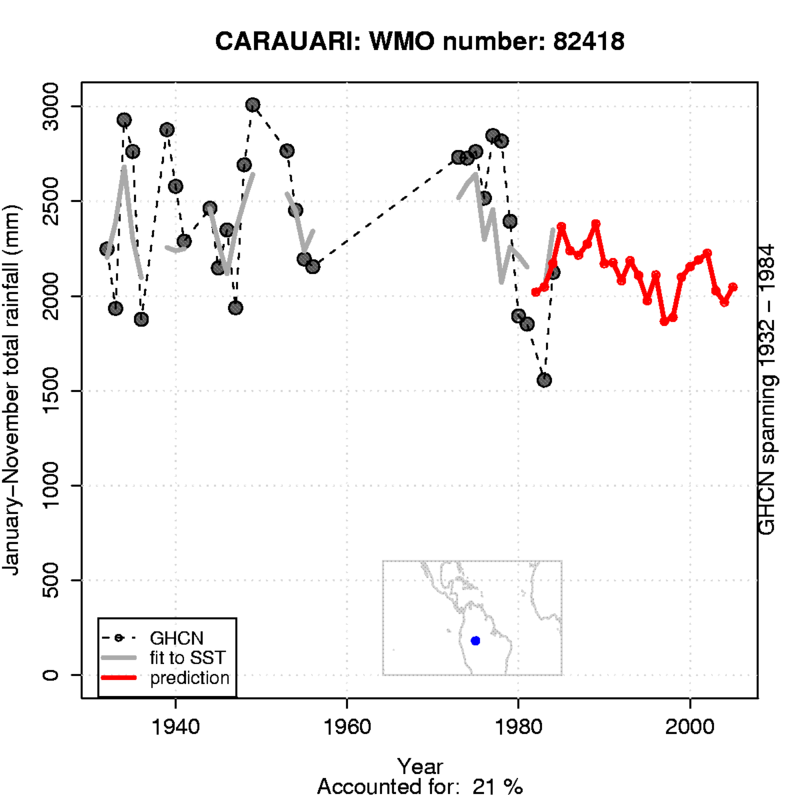 So as a prelude to a discussion of the climatological causes of the South American drought, I’m wondering if y’all can provide a more detailed explanation of the available data on what the anomalies are both temporally and spatially, and how relatively uncommon those anomalies are? 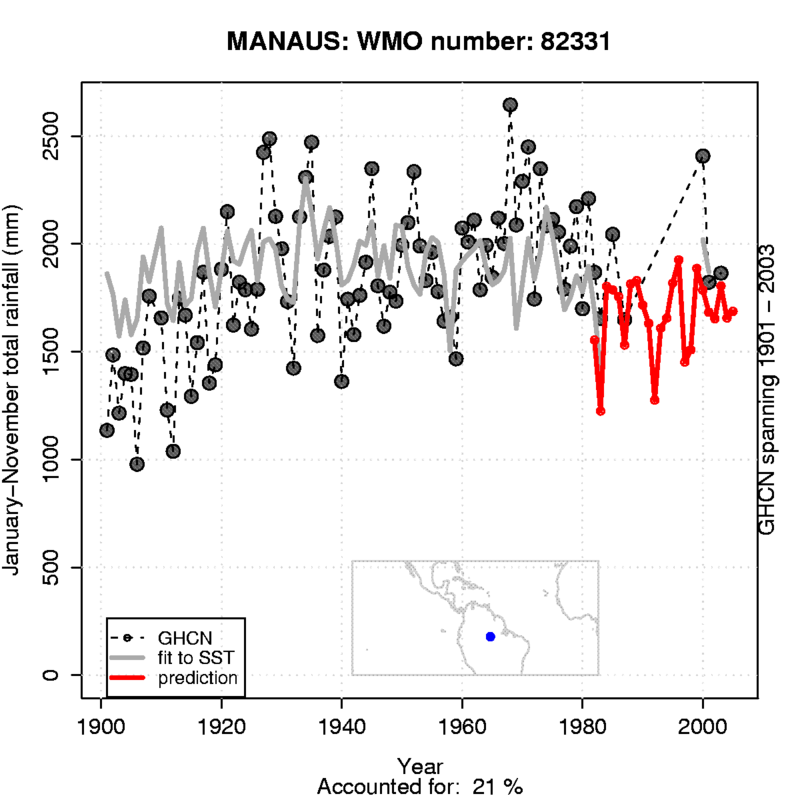 The 2005 anomalies clearly show a great deal of inland drying that wouldn’t be captured in the data linked to above. In the definition of attribution, I think the P and P_0 should be swapped so that P_0/P< =1 and 0<=1-P_0/P<=1. Anyway, now that my mind has accepted that GW is very likely happening, my unscientific thinking is that anything that might fit the expected patterns & effects of GW is probably due, at least in part, to GW, and what I would need to be dissuaded is someone to prove at the .05 significance level that it is not due to GW. I don’t think Katrina & the Amazon drought would meet my high standard of proof that they could not possibly be due to GW. So, it’s GW for me, or at least a couple more bits of GW evidence. I’m also wondering about the extreme cold snap in North India, where it apparently dipped 60 degrees F below normal, and killed many people. Could this in any way fit what might be expected in a globally warming world? I know “cold” doesn’t seem to fit, but I have the idea (perhaps mistaken) that GW might entail greater extremes or standard deviation in temps. Or maybe it has to do with melting glaciers in the Himalayas causing some freezer effect. If I had time, I’d just take some course on all this, instead of bothering you. Re # 5. Thermodynamics. The system Earth is struggling in thermodynamic terms. We knew about maybe 20 and more years ago, that extreme events would be taking place. When a system tends to equilibrium, there are chaotic events involved, temperatures can reach highs and lows. As I understand, before Earth more or less stabilizes (a warmer Earth then), the Ice Age is a strong possibility. And alll this hard way is full of harsh and unexpected situations. With respect to monitoring “drought” conditions, including the recent drought in the Amazon, readers might be interested in the two links I have included below. They are analyses produced by the climate monitoring group at the IRI, Columbia Earth Institute and include the standardized precipitation index (SPI) and a related, weighted anomaly standardized precipitation (WASP) index, which emphasizes the annual cycle. These indices are based on accumulated rainfall deficits over different averaging periods ranging from a month to a year. The rainfall data used in the indices is from the climate prediction center, “CAMS_OPI” data set and should be considered preliminary. By clicking on the maps at these links you can look at alternate times. 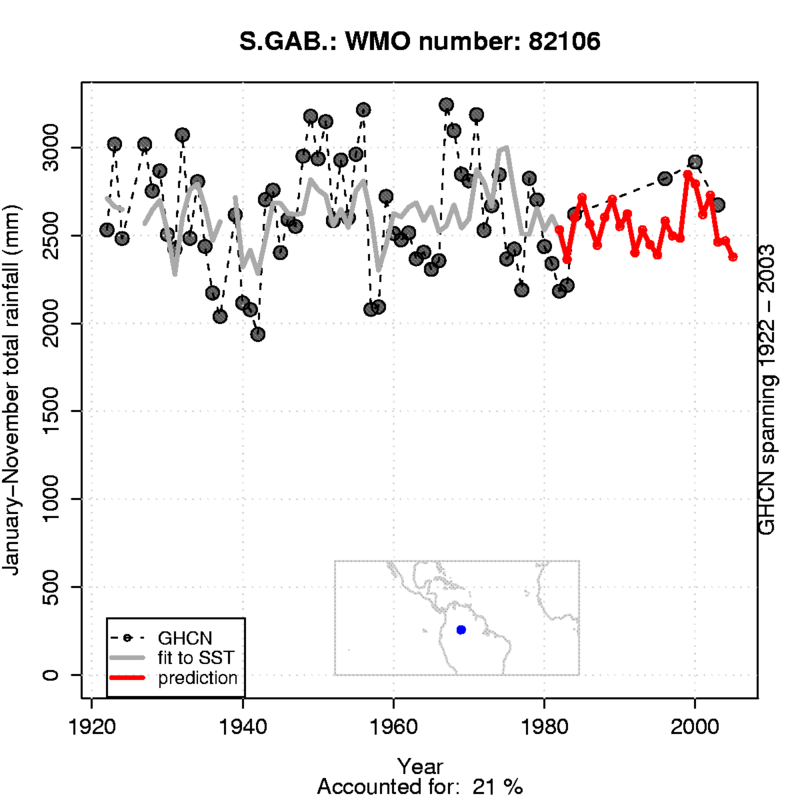 For example, the 3-month SPI and WASP for Mar-May 2005 capture the drought mentioned in western Brazil quite nicely. In reference to comment #6…. I always have had a hard time understanding the increased storminess and extremes from global warming which includes drought. If the temperature gradient between the poles and the tropics decreases, how are there going to be more snowstorms and blizzards? In addition, extreme cold during global warming? That is counter-intuitive. Also with more water vapor and an enhanced hydrological cycle, shouldn’t drought be less prevalent? The stronger hurricane connection, I can see, at least superficially. GW leads to higher SSTs, more fuel for hurricanes and thus potential exists for stronger hurricanes, all things being equal. Also, assuming a water vapor feedback, I can see… more water vapor available for a storm, all other things being equal, more precipitation. Also with increased moisture, you get increased latent heating during a storm which could increase its intensity, so superficially, I can see this too. Drought: This could incresae because the geographical distribution of rainfall could change more than the total amount. Humans, mostly, live and farm where they do because that is where it is convenient for us to do so in terms of where it rains, etc. Under GW, rainfall patterns are likely to change so you will get more rain than previously in some places [and therefore floods], and less rain in other places [and therefore droughts]. It’s important to realise that a ‘flood’ is not caused by an absolute amount of rain, but by a relatively high amount of rain comapred to what the pre-existing norm in that region is. Consequently the Amazon river catchment area can have a lot more rainfall before the Amazon floods than can the Thames [in an absolute sense]. As far as storminess goes, you are correct that the temperature gradient is very important, but, whilst that is predicted to decrease [due to polar amplification], it may still increase, locally, in some regions. One obvious example would be in the event of a shutdown in the Atlantic MOc [or ‘Gulf Stream’] which would increase the gradient across the Atlantic. In terms of the extreme cold, there could be local factors, a change in weather patterns, etc, and Northern India is very mountainous, but I don’t think any plausible mechanism has been proposed in any detail. If the (AO or NAO) becomes more positive as some of the models suggest, then it would imply cooling at high-latitudes and associated increase in the temperature gradient. The positive phase of the AO is associated with a stronger polar vortex as you are probably aware. This implies a stronger pressure gradient aloft and through the thermal wind relation…stronger thermal gradients. Cold air remains up north through a deeper layer of the troposhpere. Surface atmospheric pressure is lower than average in the far north, and the mid-latitudes don’t see a lot of arctic highs moving south. The high latitudes would be colder in these instances. This is counter to the GW assessment that the high latitudes will warm more. Also, if the high latitudes warm more relative to the lower latitudes…the stratosphere would cool more in the far north/south than at low-latitudes. The jet would become weaker and potentially buckle more. That is one way that we may see more intrusion of arctic air more. But the AO/NAO would tend to be more negative. With the projected more positive AO/NAO, I don’t see the connection to high latitude warming. Yes, we would defintitely be interested in more than just the numeric production of mid-latitude cyclones. For example, one could imagine conditions that generate more cyclones over the Pacific. We can often observe magnificient, near-hurricane intensity cyclones approaching the west coast (especially from the WA/BC area up to AK). These systems often have very little energy left after landfalling, so the brunt is felt along coastal and windward-mountainous areas. The majority of North America would therefore not (likely) experience more storms in a scenario with only increased Pacific storminess. If, on the other hand, conditions favored more “lee-side cyclogenesis” (which is just cyclone development east of the Rockies), then most of the continent would experience more storminess, although the intensity could easily be mitigated by the interactions of other so-called synoptic features. The next driver would be the tracks of the cyclones themselves, which are largely determined by mid-and-upper-tropospheric flow configurations. There are really only a few regions where cyclones tend to originate, and this seems to have as much to do with topography as with the ambient meteorological conditions. In general, though, lee-side storms that develop in the prairies of Canada (e.g., the “Alberta Clippers”) tend to be associated with light snows, and colder air…these very conditions, however make it relatively easy to meet the “blizzard” criteria in open areas. Storms that originate in Colorado, on the other hand, often have a much greater snowfall potential, with actual “blizzard” potential being controlled somewhat by the extent of the horizontal temperature gradient, among many other variables. Almost any lee-side storm has the potential to go berzerk once it gets over the Atlantic, but I think that a great number of Nor’easter type storms derive their energy from Gulf Coast impulses. Thus, to assess future storminess (and note, these “storms” are not the same as thunderstorms or severe thunderstorms, which do not require a surface cyclone under proper conditions–and this is a simplified explanation) it seems we would want to get a grip on a) the projected frequency of cyclones, b) the areas where cyclogenesis would be increased (or decreased), and c)the expected flow regimes in the mid-and-upper troposphere. Just for starters. And I am sure the current operational meteorologists could throw in a couple dozen other variables, just to sweeten the pot. The only thing that seems straightforward is that whatever changes do occur, we should not expect them to be uniform in space or in time…so the East Coast may be “stormy” while the Upper Midwest has yet another snow drought. How often do droughts occur in the amazon? (the NY Times link does not work). It is impossible to predict everything, as most of you know better than me. What seems logic and mathematically correct is not always as it seems. “Global warming could trigger an Ice Age in the northern hemisphere as seen in a recent Hollywood disaster movie, a groundbreaking study suggested today. “The researchers say a bipolar climatic ‘seesaw’ effect – last triggered when the Earth heated up after the Ice Age – could happen again. The team spent 14 years analysing radiocarbon and isotope samples from Patagonia in South America – the most southerly land mass outside of Antarctica – where they built up a picture of glacier changes in the past 25,000 years. These findings are being discussed with concern by a huge part of the Scientific community involved in these studies. “Establishing leads and lags between the northern and southern hemispheres and between southern mid-latitudes and Antarctica is key to an appreciation of the mechanisms and resilience of global climate. This is particularly important in the southern hemisphere where there is a paucity of empirical data. The overall structure of the last glacial cycle in Patagonia has a northern hemisphere signal. Glaciers reached or approached their Last Glacial Maxima on two or more occasions at 25â��23 ka (calendar) and there was a third less extensive advance at 17.5 ka. Deglaciation occurred in two steps at 17.5 ka and at 11.4 ka. This structure is the same as that recognized in the northern hemisphere and taking place in spite of glacier advances occurring at a time of high southern hemisphere summer insolation and deglaciation at a time of decreasing summer insolation. This patagonia work is very interesting, but may not show the whole story. One important question concerns the status of the Younger Dryas (ie whether it was a global event or just restricted to the Northern hemisphere). We have just published a paper in Quaternary Research (no link as yet) showing the glaciers on the northern side of the North Patagonian Icefield expanded throughout the time covered by the Younger Dryas. This doesn’t mean that it was a YD event but suggests, with similar studies elsewhere in the SH that there probably was synchronous cooling at this time. Our work in Patagonia since 1991 has also suggested that the glaciers there retreated from their late holocene positions at the end of the 19th century, and we suggest that this represents a response to post-Little Ice Age warming. the LIA is also probably a global event. Was the Amazon drought caused by warm seas. Another thing occurred to me. I saw a program years ago about how warm oceans compete with warm lands for precipitation (e..g., the monsoon) in the Indian Ocean area. If the seas warm up, they take the rainfall away from land, having it precipitate over the seas. So even if the precip is not changed much (which it probably will be), GW could cause it to precip more over seas & less over land. Thanks, Mike, for your reply to my post (17). Having read the papers you suggested, I agree that we shouldn’t use MWP and LIA as fixed and homogenous periods of warming or cooling. It does seem to me significant, however, that glaciers as far apart as Kazakhstan, North America, Europe, New Zealand and Patagonia receded from their late-Holocene maximum limits around the same time (18th and 19th century mainly). No doubt there was considerable decadal variability during these time periods (which the glacial record is not always able to resolve) but their gross behaviour does suggest (to me at least!) globally synchronous behaviour. With respect to comment 15-17. The Patagonia data emphasizes above all else that the timing of major glacier retreat and advance is dominated by the NH signal. This has been born out by ice core analysis by Lonnie Thompson’s group at Quelccaya and Huascaran. Ice Cores at Huascaran and Sajama in the Andes also showed, much more definitively than glacier advance dates can, and more reliably than they can be dated, that a Younger Dryas cooling was experienced in the Andes. The dating of the late glacial advances also matches well advances of both the Puget Lobe and Great Lake lobes. This paper does not provide a compelling argument to me of a bi-polar seesaw of climate in and of itself.